Summer heat carries with it a risk of dehydration. 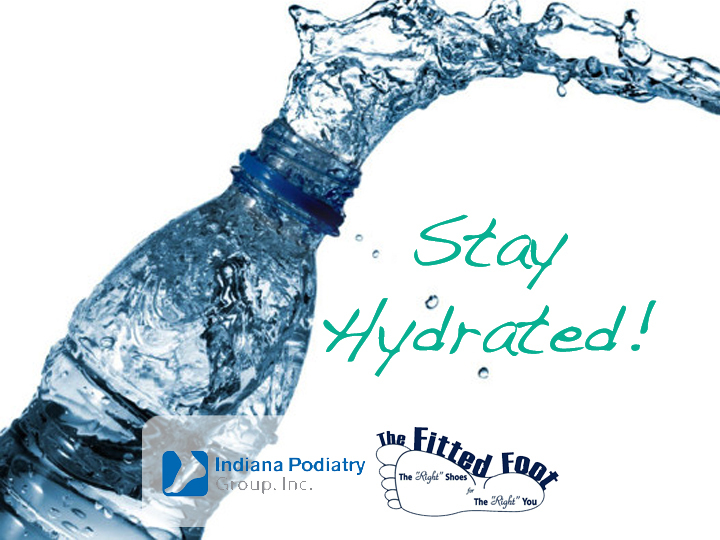 But sunburns on the feet can also contribute to dehydration when bad enough to cause the feet to swell and pull the fluid you need in your body to the damaged tissue in the feet and legs. To combat this situation, carry a water bottle and when water is within arms reach you are more likely to take a pull from it. Studies also show people increase their alertness in the minutes after drinking water. In the evenings you can even sip on a decaffeinated herbal tea. Why decaffeinated? Because caffeine is a chemical that shuts down your anti-pee hormone which has the effect of increasing your elimination of precious fluids. And finally, eat watermelon or other water-rich foods like vegetables, fruits. you’ll automatically up your fluid intake. On the other hand, processed snack foods like chips, crackers, and baked goods have minimal water content.